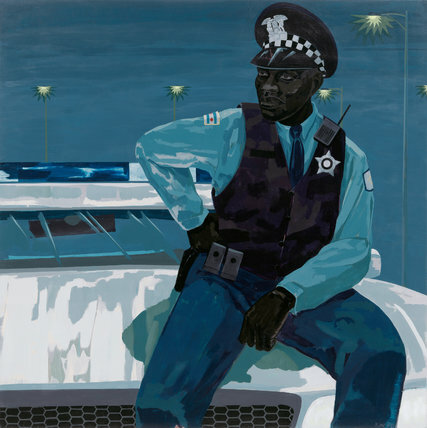 A 2015 Kerry James Marshall painting of a vigilant-looking black policeman seated on the hood of a white squad car looks like a taken-from-life-figure, and one radiating mixed messages of aggression and protection. The image has a particularly complex resonance not just in the context of St. Louis, where police violence led to Black Lives Matter’s becoming a national activist movement, but also in light of President Trump’s recent urging that police get physically tougher when making arrests. Kerry James Marshall’s “Untitled (Policeman)” (2015), in Glenn Ligon’s “Blue Black” show. In Lynette Yiadom-Boakye’s painting of a dark-skinned woman wearing an open-backed sapphire-colored dress, blue, black and brown subtly interact. Like Mr. Marshall, this artist has made a close study of depicting African-American skin tones. And her insertion of fictional black figures within a mostly white tradition of portraiture is a political gesture in itself. So is a self-portrait by Jack Whitten, remarkable for being all but abstract: an explosion of mosaiclike squares of blue and white color on a black ground — pure, atomized energy. 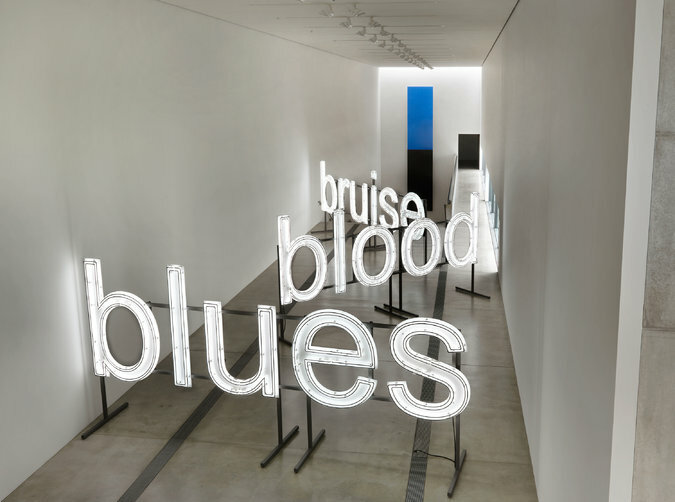 The Kelly piece, 28 feet tall and permanently installed in the foundation’s atrium, comes with no known political subtext, but Mr. Ligon adds one by installing near it a text sculpture of his own, which spells out in white neon tubing “blues,” “blood” and “bruise.” All three words are from a historical source: a 1964 description by a Harlem man of the injuries he suffered at the hands of the police when he was wrongly jailed. At the Pulitzer Arts Foundation, Mr. Ligon’s piece is positioned so that, from some angles, you view the Kelly piece through it. Much of the show operates on this strategy of connecting through proximity different kinds of layering and revealing. In a downstairs gallery, a 1967 abstract painting by Richard Pousette-Dart, a haze of blue and yellow daubs, reflects that artist’s cosmological interests. It hangs beside Ross Bleckner’s 1993 “Galaxy,” in which an irregular grid of glowing lights was conceived as a memorial to friends who died of AIDS. Derek Jarman’s indelibly elegiac film “Blue,” from the same year, is visually just a field of unbroken and unchanging azure. After Jarman started working on it, he learned he had AIDS and gradually lost his sight. The blue screen became an image of blindness; the spoken soundtrack, lifted from his journals, a chronicle of dying. The Jarman film is a self-portrait that doesn’t call itself that. There are others. A brushy black, white and sky-blue painting by Louise Fishman is a kind of encephalographic image of a personal practice of meditation. In Lyle Ashton Harris’s 2002 blue-tinted photograph of Billie Holiday, that great diva of black jazz is played by the artist himself. Foreground, Mr. Ligon’s “A Small Band,” from 2015, juxtaposed with Ellsworth Kelly’s “Blue Black,” painted aluminum panels from 2000, in the background. In some cases, spirits are present but bodies are missing, as in a patchwork wall hanging by the South African artist Turiya Magadlela stitched from black and brown nylon pantyhose. The title of Byron Kim’s gorgeous painting “Innocence Over Blue,” along with its image, comes from a poem by the St. Louis writer Carl Phillips describing the color and texture of a bruise on a lover’s skin. By the look of it, Mr. Kim’s picture is about as abstract as abstraction can get. So is “Blue Serge” by Jennie C. Jones, which combines an acoustic panel and a canvas painted with blue and black lines to suggest a connection between Modernist painting and improvisational jazz (examples of which you can hear in a self-service Blue Black Library). David Hammons forges links, too, but different ones, between art and street in his 2014 piece “The New Black,” which consists of a blue gestural painting covered up, and canceled out, by an overlay of black industrial tarp. Mr. Hammons is a touchstone figure for Mr. Ligon, and for many other artists interested in making work that can accommodate political readings without being confined to them. And there has been no more effective example of this versatility than the 2002 installation “Concerto in Black and Blue.” For this piece, Mr. Hammons simply turned out the lights in a large New York gallery, handed out small blue LED flashlights, and let visitors find their way. Tentatively inching forward, everyone shared the same darkness; in the glow of the little torches, everyone shared a color: blue. Fifteen years later, America is a different, less promising place. Inequities defined by race and class have intensified and in the present political climate are likely to grow. In what some people view as a second black civil rights movement, combative lines are drawn, and their tautness is evident even in the cushioned art world, which is shocked to discover, all of a sudden, that white artists are no longer automatically free to collect big rewards for telling the story of African America. If “Concerto in Black and Blue” appeared today, it would most likely raise a basic question, namely, “What audience is this show for?” And in the current Black Lives Matter era, when affirming the realities and the rights of difference feels far more productive than promoting the slippery idea of sameness, the same question could be asked of “Blue Black.” In a complicated, unfolding way, Mr. Ligon is asking it by broadening the possibility of response rather than sharpening it. Of the images he has chosen, Mr. Marshall’s grim, watchful, unreadable black trooper silhouetted against a white car — is he friend or foe, and, if either, to whom? — is the pertinent one for this moment and this city. But with steady, resistant grass-roots pressure and a bit of electoral luck, this may not always be so. Blue, in myriad shades and forms, could be the dominant, blending color of tomorrow.